The Analytic Trading ATR indicator simply adds a small line of text to the top left corner of your charts to show the current timeframe average true range of the last 25 bars, and the total range of the current open bar in price, pips or points. Knowing the average range of recent bars gives a numerical value for the average market price range per bar – this is the market’s recent volatility. Then we can see the likely range of currently open bar and how far price has moved compared to this average range in price, pips or points (and in brackets as a percentage) and therefore, what is a reasonable expectation for further movements on that current timeframe. We are looking for entry and exit prices that are of the highest value to us for our trade direction. This is where the market may be over-extended, in retracement from our latest candle bias, and/or close to a strong support or resistance level. The ultimate target is to open and close trades when the price of the current open bar on the timeframe we are trading is at over 100% of its ATR. This gives us the maximum chance of trading at an exhaustion price, and a lower chance that the movement will continue to move against our current trade direction bias. In most cases these settings can be left on the default values, although users with different strategies, or preferences to our own, may want to be able to adjust them. ShowDistance true true/false Shows the additional text for the size of the currently forming candle in price, pips or points and as a percentage of the ATR. ChartATRPer 25 whole numbers The number/period of bars used to calculate the ATR, generally a value of 25 will cover the average timespan of two timeframes higher and 5 would be a good average to cover one timeframe higher. DisplayType native native/pips/points This is the decimal point display of price. 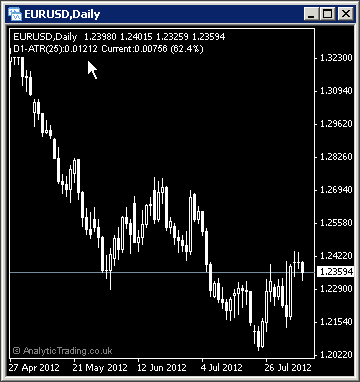 For example on EURUSD on a 5 decimal place broker; native=0.00100, pips=10, points=100.